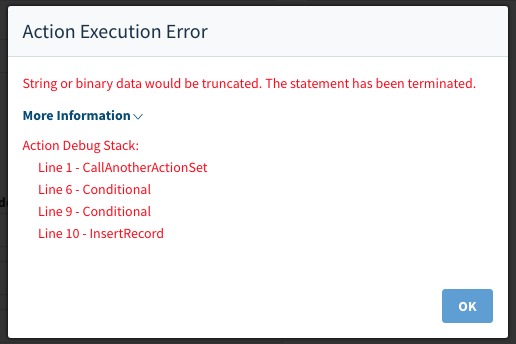 What is an Action Execution Error? Understanding Action Execution errors in Method. Entering in a name and it's too long (too many characters). A Yes/No field is blank and hasn't been chosen. A field has been blanked out and the screen is trying to process. 1. Take note of what app you are on, and which screen you are on. The tab name on your browser will indicate which screen you are on. In the below example, the screen name is "New Contact." 2. Expand the link which says More Information to view where the error is exactly occurring. 3. Take a screenshot of the error. 4. Please contact our service team at https://www.method.me/contact-us/ or use our chat system. This will help you find the error so you can fix it. 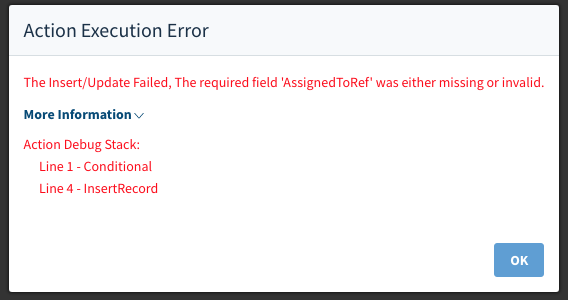 The Insert/Update Failed, The required field AssignedToRef was either missing or invalid. Insert/Update Failed - Either Insert Records into Table or Update Fields in Table action had a problem. The required field - The problem dealt with a required field. Field AssignedToRef - The name of the field is AssignedToRef. Either missing or invalid - The value given to AssignedToRef was empty or an improper value for that field. The Action Debug Stack tells us where the error happened. Note: Unfortunately, the error does not tell us which event the error is in, only the actions. It will be important to note how the error happened. If the error happened because you clicked a button, then the error originates with the button press. However, if the error happened when you enter a screen, then the error is in one of the events of the screen. In our example, the error occurred when I clicked the Save Activity button, so I will need to customize the screen and go into its Click event. Line 1 - Conditional: The error is embedded in a conditional. Line 4 - InsertRecord: Since this is the last line in the debug stack, this is where the error occurred. Now that we know where the error is, we can go into our Insert Records into Table action and see what went wrong!